Meal prep the way to your weight loss goals with these fabulous low carb recipes for the keto diet! From helpful tips to the best keto crockpot, Instant Pot, and low carb meal prep recipes for breakfast, lunch, and dinner- this is the must-have meal planning guide! This post contains affiliate links at no additional cost to you whatsoever. For more information please visit my disclosure page here. Are you a Meal Prepper? Also known as batch cooking, Meal Prep Mondays, or cooking all weekend the country (and Instagram) is obsessed with it. Those of us on strict diet plans like keto understand why: meal prepping is the key to weight loss. Now, if you’ve been on the keto diet for longer than a minute, then this isn’t new to you. You already know meal prepping, and planning is essential to losing weight on the ketogenic diet plus it saves you money and in the long run-time. But meal prepping doesn’t come quickly to everyone! Raise your hand if you’ve ever tried to make a quick trip to the grocery store to grab your “meal prep stuff” and emerged three hours later an older-more defeated version of yourself. Well, in case I’m not the only one with a hand raised here I thought I’d share a few keto meal prep tips I’ve picked up over the past few years to simplify things for you! Then I’ve got some fabulous low carb recipes that are perfect for whatever you want to call the day you decide to do your meal prepping! Nail down a process for finding your week’s recipes and make your grocery list. Make it easy on yourself by selecting recipes that you can eat more than once, or that you know you can use for multiple meals. I’m talking about make-ahead meals that will make your life easier! Seriously, look into it because if I can learn how to navigate a kitchen (at over 40 years of age) you can too! Save your recipes to a Pinterest board or screenshot your favorites-whatever works best for you. Make sure each meal includes a balance of healthy fats, lean protein, vegetables, and fiber-filled carbs. Don’t know the right balance for you? Here’s a Free Keto Macro Calculator that will tell you exactly what you should be eating depending on your goals! Here’s the Ultimate Keto Shopping List – download it for free! You can find a ton of fabulous ketogenic recipes for breakfast, lunch, and dinner here & these are a few of my quick keto dinner favorites! Unless spending all day cooking, chopping & dicing is your passion, don’t spend an unlimited time meal prepping! Set a timer for 2-3 hours and when it dings-you’re done! You’ll be surprised at the amount of food you can prep in a small window of time. Start by cooking things like chicken or beef (that take the most time) and get the chopping & dicing done while you wait. I like to gather any herbs and spices I’m using at this time too-just to have them all in one place. I haven’t gotten around to organizing my spice cabinet yet, so this helps save time and frustration. Speaking of spice cabinets is it normal to have ten half-full garlic powders circa 2005? I really need to get on top of that situation ASAP! Make it easy on yourself by using perfectly portioned reusable meal prep containers. If you prefer glass go with this Glasslock set. I know it’s tempting to go on the cheap, but trust me, you don’t want to. Invest a little more and be sure your food is sealed efficiently (to avoid freezer burn) and your containers will last. Plus, you won’t have to fight with those bleeping lids that are just the worst. For a plastic option, these are fab & freezer, microwave, and dishwasher safe meal prep containers! Use freezer tape & a Sharpie to label each container with the meal info/macro #/date prepared and use by date! You may want to jot down a few recipe notes too! You can pre-roast a chicken on meal prep day and use it for making soups, salads, and sandwiches later in the week. Speaking of chicken-you’ll want to take a look at these 26 Easy Keto Chicken Dinner Recipes! They’re perfect for meal prep! Batch cook bacon to keep on hand in the fridge or freezer for recipes-if you can keep it! Mine has a way of disappearing into my mouth. No matter which make or model you are operating with you are looking at your best time-saver! For example, it only takes 15 minutes to put together these mouth watering burritos in your slow cooker. Then you’ve got around 8 hours free to enjoy life until you’re in pure burrito heaven. Here’s 40 more of my favorite keto crockpot recipes! You may also want to take a look at these Keto Instant Pot Recipes & 25 Low Carb Slow Cooker Recipes! You’ve got two options. Save money on veggies (& fruit) and choose recipes using those that are in season. Yes, that does make meal planning take a bit more time, but it’s an option. Also, you can buy fruits & veggies in bulk and freeze for later. Or buy frozen veggies & fruit-they are picked at their peak & often contain more nutrients than fresh! Just go ahead and buy them pre-cut. I’ve found that I throw away fewer onions and it doesn’t cost that much more! With three kids and a busy schedule, I consider this a fair trade for the time it saves me! You can freeze almost anything! If you are trying to save money or plan ahead or both – Learn how to make your freezer work for you! I’m telling you freezer cooking helped me SO MUCH! Read the Busy Mom’s Guide To Healthy Freezer Cooking if you want to know more. There’s a free Freezer Foods Cheat Sheet you can download/print/save for future reference! Do Not Miss These Low Carb Freezer Meals! 21 Keto Freezer Meals For Breakfast & Dinner! Yes, hangry. You know, when hunger meets anger, and you no longer can function as an appropriate human? Those are desperate times, y’all. If that’s 3 o’clock and you’ll be at the office or the magical wonderland that is the school carpool line, make sure you’ve prepped something appropriate to eat like one of these fat bombs or keto snacks on the go! Hear me out on this one. A few years ago I read an Oprah-esque article about how women need to take their power back and yes, that included the kitchen. You shouldn’t feel like you’re slaving your weekend or weeknights away! Cue up a little Rump Shaker or Cheeseburger in Paradise while you’re doing your best Betty Crocker or better yet-your best YOU. Play whatever makes you happy. Hang a disco ball over your sink if you want to! P.S. – You can read the article here. Pro-Tip: Buy a Cast iron skillet to pretty up your food. As in, an official keto meal plan delivered to your inbox every single week. It’s pretty fantastic. Just so we’re clear here I’m talking about easy to read recipes with macronutrient breakdowns. Ready to go grocery shopping lists and snack recommendations that you can pull up on your laptop or iPhone no matter where you are. Tasteaholic’s Meal Plan totally rocks, y’all. And they let you try it for FREE!!! Here is the link to easy weight loss & sanity! Without a doubt, a low carb diet works. I’ve lost over 90 pounds. But I had to learn to plan and prepare my meals to get there. It wasn’t easy with a family of three (now 5! ), but I did it. Planning my meals and learning the right way to meal prep for my diet got me to my goal (& keeps me here.) And if I can do, you can too! Ok. It wouldn’t be right for me to give you all of these fabulous keto meal prep tips and just leave you hanging. So I’ve collected the best ketogenic recipes to start meal prepping for breakfast, lunch, and dinner for you. Most of these are make-ahead situations to save you time later on in the week. 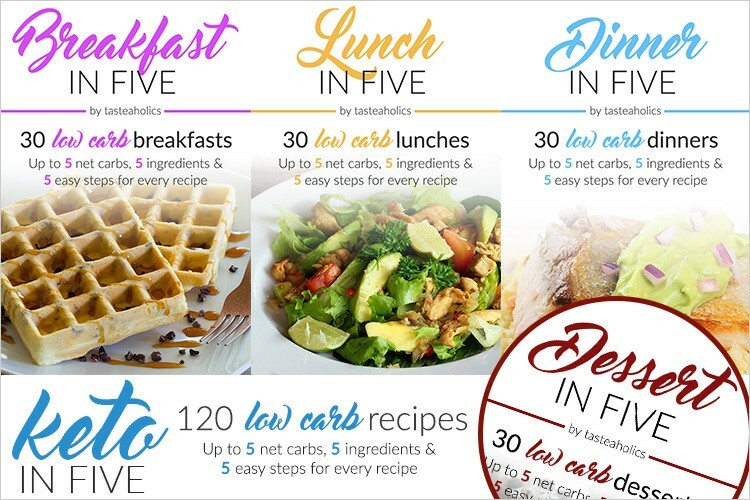 Check out the Keto In 5 Bundle Check out the Keto in 5 bundle from Tastaholic’s! 120 low carb recipes for breakfast, lunch, dinner, and dessert-all under 5 Net Carbs, with 5-ingredients or less, & only 5 easy steps! Click here for more info! Go-ahead & Save these Meal Prep tips & recipes! For more low carb inspiration, please follow my Keto Recipes board! Here are a few more great resources to help you along the way!